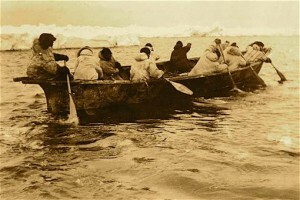 Paddling an umiaq (seal skin boat) in search of bowhead whales in the Bering Sea, circa 1905. UAF-1959-875-13, S.R. Bernardi Photographs, University of Alaska Fairbanks Archives. The Alaska Historical Society is interested in hearing from you. If you have ideas for furthering the interests of Alaska’s heritage, let us know. We welcome your suggestions for Society matters, legislative initiatives, and for our publications, Alaska History and Alaska History News.